Amsonia are definitely wild at heart, yet they make excellent potted plants. These native wildflowers offer both sky-blue blossoms and feathery green foliage that flushes to gold in autumn. Read on for more information on potted amsonia. Can You Grow Amsonia in a Container? Can you grow amsonia in a container? Yes, indeed, you can. Container-grown amsonia can light up your home or patio. Amsonia brings with it all of the benefits that come with being a native plant. It is easy to grow and low-maintenance and drought tolerant. In fact, amsonia thrives happily despite entire seasons of neglect. Amsonia plants are known for their willow-like foliage, with small, narrow leaves that turn canary yellow in autumn. Blue star amsonia (Amsonia hubrichtii) also produces starry blue flowers that dress up your garden in spring. You can grow blue star in a pot quite easily, and container-grown amsonia makes a lovely display. Although amsonia works beautifully as an outdoor perennial in U.S. Department of Agriculture plant hardiness zones 4 through 9, container grown amsonia is also attractive. You can place the container outside in the patio or keep it indoors as a houseplant. Be sure to select a container that is at least 15 inches (38 cm.) in diameter for each plant. If you wish to plant two or more amsonia in one pot, get a significantly larger container. Fill the container with moist soil of average fertility. Don’t splurge on richer soil because your plant won’t thank you. 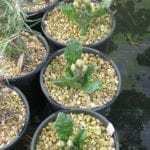 If you plant blue star in a pot with very rich soil, it will grow in floppy. Place the container in an area that gets a good amount of sunshine. Like amsonia in the wild, potted amsonia needs sufficient sun to avoid an open and floppy growth pattern. This plant grows fairly large if you don’t cut it back. It’s a good idea if you are growing blue star in a pot to cut back the stems after flowering. Trim them to some 8 inches (20 cm.) off the ground. You will get shorter, fuller growth. 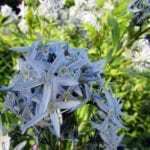 Read more articles about Amsonia.